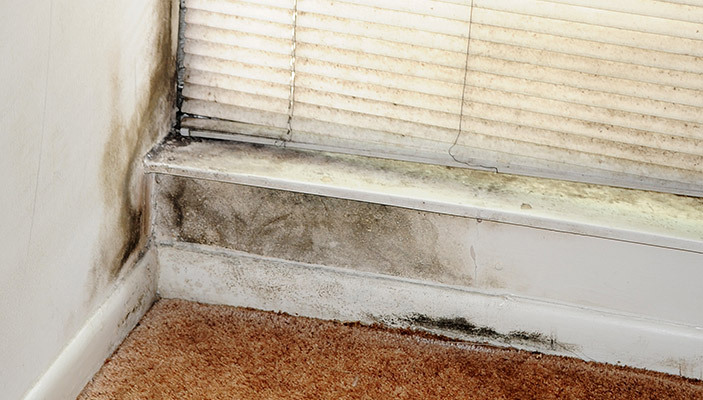 After water intrusion in a home, office, or other building, mold is a common problem. While National Water Restoration is very experienced in cleaning such messes, many do not take advantage of our services when they should because they are not aware of the dangers of mold. Unfortunately, mold is often much more pervasive than one would imagine. It can lurk behind walls, grow in carpet, beneath hardwood floors, in cabinets, and other spots. And, mold can be more than just ugly, it can actually have a negative impact on the health of anyone in the building. According to the federal Environmental Protection Agency (EPA), mold spores are everywhere around us all the time. It is a matter of the concentration of these spores and the types that actually has an impact on one’s health. Unfortunately, modern buildings are ideal breeding grounds for mold, given the materials from which they are made and their abundance of hidden, dark, cool, and damp spaces. Moreover, these materials can leak and trap moisture, while modern appliances may emit water vapor or leaks of their own, further exacerbating the problem. There are actually a relatively small number of mold species that have been identified as having negative impacts on the health of humans. These species of mold produce a toxin called mycotoxin, which is believed to cause the negative reactions experienced by some humans. Of the 100,000 species of mold known to man, only about 50 have been identified as producing mycotoxin. Still, for anyone who has suffered from a negative reaction to this toxin, 50 species are more than enough. About one in three people are allergic to mold in varying degrees of severity. For some, it can cause or aggravate asthma symptoms. In the young or old, it can have even more damaging health effects, creating symptoms like respiratory problems, swelling, and in extreme cases, even death. Mold can also have an extremely negative impact on the value of one’s home. Many home inspectors will flag it as a condition requiring remediation, giving buyers leverage in the negotiation over home prices. The only way to prevent mold is to keep the building dry, addressing sources of water intrusion promptly. Also, if any indications of mold are identified, it is important to immediately clean the affected area or the mold will spread. National Water Restoration is an expert at such mold remediation work, and has special equipment to both protect the home and the people inside of it. We also have an entire team of professionals able to not only clean the building, but return it to like-new condition when the work is completed. Only by using the services of a professional mold remediation specialist like National Water Restoration can you hope to completely and properly remove all of the mold from your home or other building. This is the best way to prevent further damage and expense, to protect everyone in the building, and to keep the mold from returning later.